Listen as the deep sea sighs. From the creators of Outback Lullaby, Bushland Lullaby and Rainforest Lullaby comes this soothing tale. 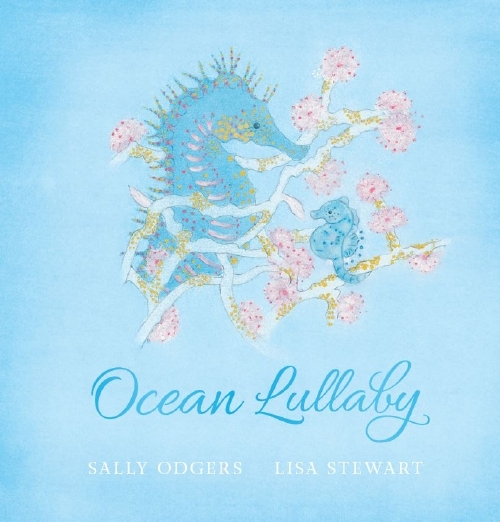 Ocean Lullaby is the perfect bedtime companion. I was born near Latrobe, Tasmania and still live here. I went to school in Latrobe, Tas. I was small and mousy. Because I have a strangely skewed body clock my brain didn’t kick in until about 10 a.m. so I expect my teachers thought I was a very odd child. I don’t remember being deliberately naughty. I do remember being surprised at getting told off for things I didn’t think were naughty! As an adult, I find it mildly disconcerting when children are encouraged to do something on the one hand and then told off for it on the other. An example is, 'Don’t run around' in one breath and 'For goodness sake get out and get some exercise' in the next. There were several. I loved the Guara series, Howl’s Moving Castle, the Romney Marsh series, the Blue Door series, The Cats of Honeytown, Ruth Park, Displaced Person (might have been older by then), Jamberoo Road, some of E. Nesbit’s books, Ethel Turner’s books, L. M. Montgomery’s books, Robert Heinlein’s junior science fiction, Nan Chauncey’s Tasmanian-set books, Geoffrey Trease’s historical adventure and modern treasure-hunting books, Gerald Durrell’s early memoirs — OK, I’ll stop now. Probably Diana Wynne Jones and/or Elizabeth Marie Pope and Monica Edwards are my longstanding favourites. I have many more recent favourites that I would have loved as a child but which weren’t written until I was an adult. These include Memory’s Wake (Selina Fenech), Michelle Tatam’s science fiction titles, The New Policeman (Kate Thompson), Polymer (Sally Rogers-Davidson) Annie Dalton’s The Witch Rose, Margaret Watts’ Legacy of the Skywasp, Donaya Haymond’s Laconia series and, as before, many others. I often have a favourite author for one or two books. I don’t necessarily like ALL his/her books which is why I tend to cite books rather than authors. Naturally, I love the Jack Russell and Pet Vet series. I think, looking at these, what I enjoy is a book with engaging characters and that something a bit different. For example, I love Polymer which is a rip-roaring space opera and Australian to boot. Diana Wynne Jones was a writer who seems to have broken rules left, right, centre and backwards, and the more bonkers her ideas the better I like it. Some of my YA books rank among my favourites. This is less to do with vanity than with writing what I wanted to read. Family and authors whose books I enjoyed, I think. A couple of my teachers also gave me a great deal of confidence, especially my Grade Four teacher Mrs Ting and my Year 7/8 English Expression teacher, Mrs Collis. Both these offered to read and edit stories I wrote in my own time in their own time. That was a huge gift to me. My sister was an author, and that was valuable too as it proved a Tasmanian kid could be an author. I was good at writing stories from my first years at school. A friend of Mum’s suggested I should try the NSW School Magazine, so I did, and my story was accepted. Around the same time, I won or placed in some state writing contests. I wrote my first published story in 1969 and my first published book in the mid 1970s when I was fifteen or so. I wrote three other books first and a kindly editor who rejected the second of these suggested I should try a collection of short stories. I did and she accepted it. It was something I loved doing and that I was good at. My teachers praised my stories, which was lovely since many of my other activities (maths and organised sport and art and handwriting etc) were anything but praiseworthy. It made sense to me to write because (a) I was good at it (b) I wasn’t skilled at other things and (c) people I trusted were pleased with my stories. They just pop into my head, often as a result of something I see, hear or do. Some of my stories have come from a single concept or line. For example when I was young, I was small for my age. This was a disadvantage, but it made me able to slide through the dog flap when Mum accidentally locked the keys in the house. I took that concept of turning a disadvantage into an advantage and wrote one of my favourite fantasies. Another came from a new report on the correlation between socio-economic status and the number of children people had. That became a YA sf novel. My fascination with names and naming has led to several titles. A remark by my husband got us talking about dogs and detection and that led to the twelve Jack Russell Dog Detective books. Mostly I write in an armchair with my laptop on my lap. When I used a desktop computer or a typewriter, I generally sat at the desk in whatever room it happened to be in. I wrote some early stories out in the paddock, or in the barn, in exercise books. It gives me a modicum of power. I can’t fix the world or even things that impinge on me and my family but I can create a world where the rules work the way they don’t in real life. It also allows me to earn a living. A lad once approached me after I did a writer’s talk at a school in Sydney and asked me if one had to look weird to be a writer. Then there was the huge cockroach that scurried towards me across a white shag-pile carpet while I was doing a story-telling session in another Sydney school. A teacher cornered it, and tossed it out of a second-storey window. It scurried off with undiminished vim. I really don’t know. I don’t have any other specific talents and I’m probably not organised enough for office work. Shop assistant or farm worker, maybe? I suspect I’d have lived in my hobbies. I’ve probably said too much already.